It became urgent to find a garage. There was none at our flat. So my Dad found one for rent about half a mile away, and the car sat there, in solitary splendor except when my parents and I walked over and opened the padlock on the garage doors. We gazed reverently at this glossy monster, touching the sleek surface (but only after wiping our hands), and sat inside with a magnificent sense of ownership, breathing that special smell, the scent of future prosperity. We told the neighbors, of course, especially those who had no car of their own, and invited them to viewings. Many of them were refugees from the recent European catastrophe, and they obliged by voicing their admiration in Yiddish superlatives. It was as though Tevye had bought a new cow. That lovely summer was so full of promise, though shaded by the memory of horrors that had left many members of my and other families murdered in “camps.” No longer were the streets of Cape Town populated by men in army and navy uniforms. No longer did my uncle Max, who served in the Home Guard, leave his helmet, gas mask, rifle and bayonet in my bedroom when he came visiting. No longer was there a minute of silence throughout the city when the noon gun, triggered by an electrical impulse from the national observatory, went off on Signal Hill. No longer did we have to draw blackout drapes each night. No longer was the port out of bounds to everyone except those with official and military permission. Even the armed sentries who guarded the entrance to Simonstown, home of the Royal Navy base, disappeared. No longer did recently arrived strangers with numbers on their arms come to dine at our table. We were all both joyous and struggling with the prospect of peace. The Chevy was a significant investment in the future, as was our new radio and phonograph combination. It was a Romeo, named after its manufacturer, Captain Romeo Buttolo, an Italian naval officer interned as an enemy alien early in the war. Captain Buttolo came to our home and installed it personally. In this kosher Jewish household, the first 78 rpm record had Beniamino Gigli singing Ave Maria on the obverse, and Agnus Dei on the reverse. I played it daily for months, turning Gigli’s solo into a tenor-soprano duet. Neither of my parents could drive. My mother never did, largely because my father wouldn’t trust her with the family chariot. My father only learned to drive about eight years later, and then became a nervous, uncertain driver. So my parents took advantage of their tentative step into the middle class, and of South Africa’s racial situation, to hire a Cape Colored driver. His name was Martin Pretorius. Martin was a gentle man as well as a really good driver. We enjoyed each other’s company and our burgeoning conspiratorial relationship - once I dissuaded him from calling me “Young Master” - an embarrassingly obsequious Victorian custom imposed upon servants. He would explain the workings of a car to me, and also tell me a little of his life and the constant struggle to survive. Aside from his chauffeur duties, my father insisted on having the car immaculately clean at all times, so sometimes, without my parents’ knowledge, I would help wash and wax our status symbol, and that gave me more time with him. One of Martin’s early tasks, in February 1947, was to drive the family to Kirstenbosch, the spectacular botanical gardens in the southern suburbs. There, after a long walk on gravel paths, my parents and I sat on the verandah of the restaurant, looking out on the gardens, and consuming our tea, with warm scones under clotted cream and strawberry jam. On the way home, a strange sight awaited us along Rhodes Drive. Crowds were gathering beside the road, and further along there were lines of policemen in white gloves. Cars ahead of us were waved through, as we eventually were, but those behind us were held back. As we passed by, with our new, polished chauffeur-driven Chevrolet, people cheered and waved Union Jack flags. Apparently, a mile or so behind us, heading in the same direction, was a convoy carrying the visiting Royal Family, King George VI, Queen Elizabeth and the Princesses Elizabeth and Margaret. When I realized what was going on, I became quite princely, waving to the crowds with that peculiar gesture of the King’s, rotating my right hand counterclockwise from the wrist. Seated in the rear, my parents were not amused. Martin giggled. During the summer vacation at the end of 1951, as I was getting ready to transition from elementary to high school, from short pants to long pants, we would, especially on weekends, be driven to the Indian Ocean beach resort of Muizenberg, so heavily populated by members of the Jewish community that it was occasionally called “Jewsenberg,” though not always with benevolence. It was a beautiful small town from an earlier age, its gorgeous beaches welcoming the rhythms of the warm breakers. On one such Sunday, along the road to the beach, traffic was slowed by a donkey-drawn cart filled with fruit and vegetables, driven by a black man on his way to market. With oncoming traffic, it became a challenge to pass the cart, and finally we got the chance. Martin had just moments to execute the maneuver, and, as he did so, the front left fender scraped the wooden cart. The pride and joy had sustained very light damage, but the annoyance in my father’s face was enough to dim the sunshine. He didn’t say much, but it was clear that he blamed Martin. When we got back home, my father kept staring at the scratched tiny dent, running his hands over it. The next day a body shop did the repair for four pounds sterling. On December 31st, Martin came into my father’s study to collect his pay. A few shillings had been deducted from his meager salary, and would be for months to come. A chagrined Martin had no choice but to accept. I witnessed that scene, and the small and large indignities and injustices of that society began to take hold. It was the first of many, many times, when I would have loud and angry disagreements with my father. We argued to the end of his life, years after I had left South Africa to live in the United States. In my parents’ bedroom, there was an elegant wardrobe of birds-eye maple (there were no built-in closets). My mother kept it locked and made sure the keys were close at hand. Sometimes I’d be with her when she unlocked it. Among the things she kept there was a family photograph album. I’d ask her to take it out, sit with me on the bed, and tell me about the people in the pictures. She would do that, and then, after turning the second or third page, would burst out crying at the sight of dead relatives, and return the album to its place. On the shelf that held the album was an envelope containing a small stack of banknotes. Money, she said, for housekeeping. Dad’s bank was quite far away, in the suburb of Salt River. One day, when mother was completely absorbed in cooking, I wandered into her bedroom and found the keys on her night table. In silence, I opened the wardrobe and took a fiver. King George VI, whose profile was on the note, didn’t seem to indicate royal displeasure. Later that day, in a shop downtown, I exchanged it for five one-pound notes, and slipped four of them to Martin. I thought of it more as an act of social justice than the theft it really was. The last pound, my social justice brokerage fee, probably went to buy a record or a book. The illicit four-pound investment in Martin yielded unexpected results. When we were alone in the car, driving along a suburban avenue, Martin would pull over and invite me to take the wheel. He was an exacting but humorous instructor. The conspiracy, even with its dangers, perhaps because of its dangers, was high comedy for us both. While I was in high school, my father learned to drive, and Martin was let go. He and I had a tearful parting. Before my seventeenth birthday, I was sent to the Cape Town Driving School. After one lesson, the instructor said “I don’t know where you learned to drive, but you’re ready for the license test.” I took it eleven days after my birthday, and passed. My parents were proud of my ability to learn so quickly, especially because it had taken two courses of five lessons each to teach my father. My last sight of Martin came on a day when my father gave me a ride downtown. I think we were driving on Strand Street, when he suddenly braked. An apparently inebriated Martin was weaving across the street. My father shook his head and said “Poor Martin.” It was the first time I’d heard him voice compassion for someone of a different race. I’ve been a licensed driver for fifty-eight years. I aced my recent renewal test at the California Department of Motor Vehicles. As I left the building, I said a silent thanks to Martin Pretorius. Another wonderful, poignant piece of writing by my favorite author! 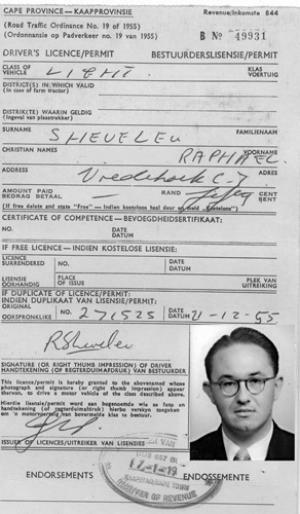 Being an ex-Capetonian who also learned to drive on a Chevy Fleetmaster, I completely identified with Raphael's marvellous tale and amazing recall of events during those days. Beautifully written and moving. Thanks, Dad!